This was a very nice hike on the Black Canyon National Recreation Trail from the Black Canyon Trailhead in Black Canyon City. 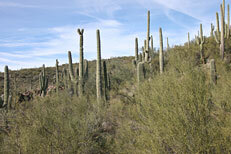 The hike was about five miles out-and-back from the trailhead to the northern crossing of the Agua Fria River. We had planned to hike a little further, but the crossing of the Agua Fria River here was bit problematic due to the high level of water, So we wandered a short ways up the river, before eating lunch and heading back. 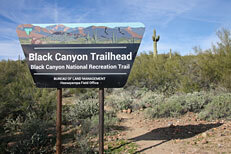 This hike on the Black Canyon National Recreation Trail starts at the Black Canyon Trailhead in Black Canyon City. 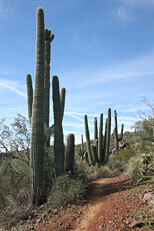 Near the start the trail enters an area with some nice Saguaro Cactus (Carnegiea gigantea). 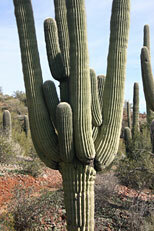 Saguaro Cactus (Carnegiea gigantea) along the Black Canyon Trail. 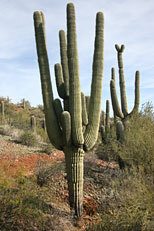 A majestic Saguaro Cactus (Carnegiea gigantea). 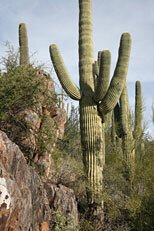 More Saguaro Cactus (Carnegiea gigantea) on the rocky hillside. 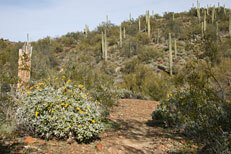 Brittlebush (Encelia farinosa) blooms along the Black Canyon Trail in front of a Saguaro studded hillside. 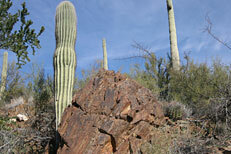 Saguaro Cactus (Carnegiea gigantea) reach skyward as a California Barrel Cactus (Ferocactus cylindraceus) snuggles against a rock outcrop. 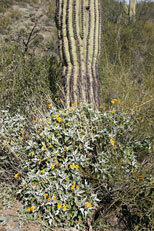 Brittlebush (Encelia farinosa) flowering at the foot of a Saguaro Cactus (Carnegiea gigantea). 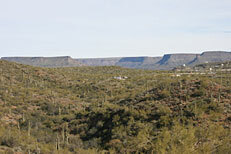 A view of the mesas to the northeast of Black Canyon City, east of Interstate Highway 17. The trailhead parking can be seen at the left edge of the photo. 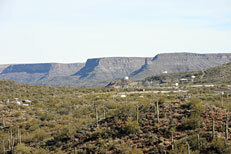 A wider view of the mesas to the northeast of Black Canyon City. 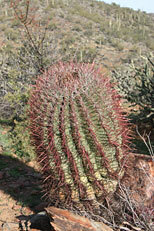 I love the red spines on this California Barrel Cactus (Ferocactus cylindraceus). 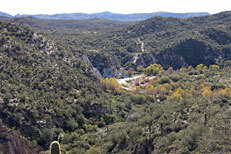 A view of a bend in the Agua Fria River. It had quite a bit of water flowing in it. 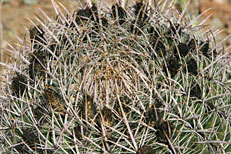 California Barrel Cactus (Ferocactus cylindraceus). The spiney crown of California Barrel Cactus (Ferocactus cylindraceus) ringed with last season's dried up flowers. 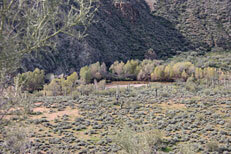 A view of the Agua Fria River lined with Cottonwoods (Populus fremontii). 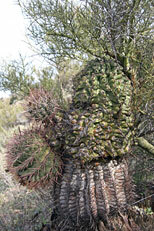 An oddball monstrose California Barrel Cactus (Ferocactus cylindraceus). 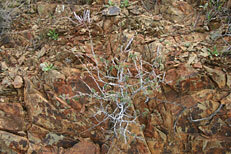 This strange growth is cause by mutations in the plant tissues which results irregular growth patterns. 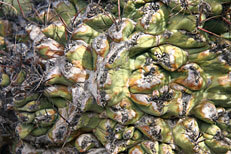 Close up of the surface of the monstrose California Barrel Cactus (Ferocactus cylindraceus). 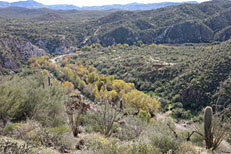 A view of the Agua Fria River. 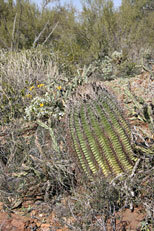 The sunny plain is covered with Buckhorn Cholla (Cylindropuntia Acanthocarpa) and punctuated with a few Saguaro Cactus (Carnegiea gigantea). 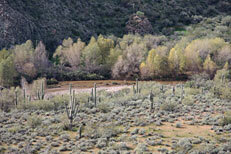 A closer view of the Agua Fria River. 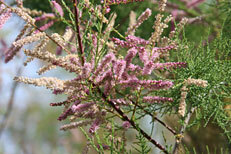 Tamarisk (Tamarix spp. 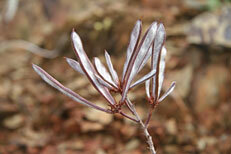 ), also called Salt Cedar, have tiny scale-like leaves and pink and white flowers. Several very similar species of Tamarisk have been introduced to North America and has become extremely invasive especially in riparian habitats and outcompeting and displacing native plant communities. 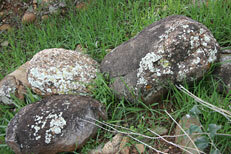 A triad of lichen covered boulders. 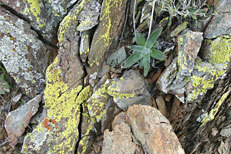 A young Dudleya saxosa nestled among lichen covered rocks. 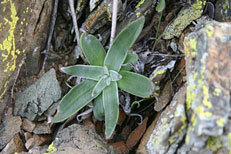 A closer view of young Dudleya saxosa. 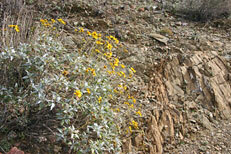 Brittlebush (Encelia farinosa) blooming alongside the Black Canyon Trail. 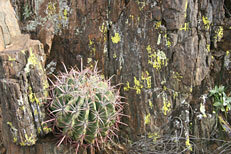 California Barrel Cactus (Ferocactus cylindraceus) takes hold in a niche on a rocky cliff splashed with lichen. There were quite a few Pink Fairy Duster (Calliandra eriophylla) plants growing in the area. 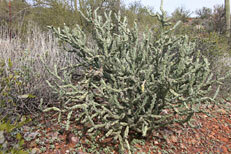 This one sporting a few seed pods. Seed pods of Pink Fairy Duster (Calliandra eriophylla) are covered with short, white, soft hairs and outlined in a brownish red color. 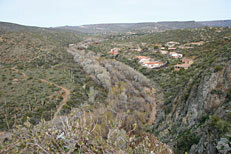 A view looking north up the Agua Fria River and overlooking a deveolopment of Black Canyon City. 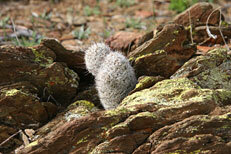 Arizona Fishhook Cactus (Mammillaria Grahamii) finds a foothold in a lichen covered rocky shelf. 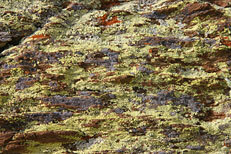 A wonderful lichen covered cliff face. 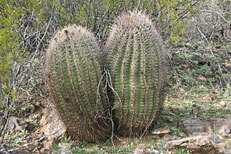 A duo of California Barrel Cactus (Ferocactus cylindraceus).